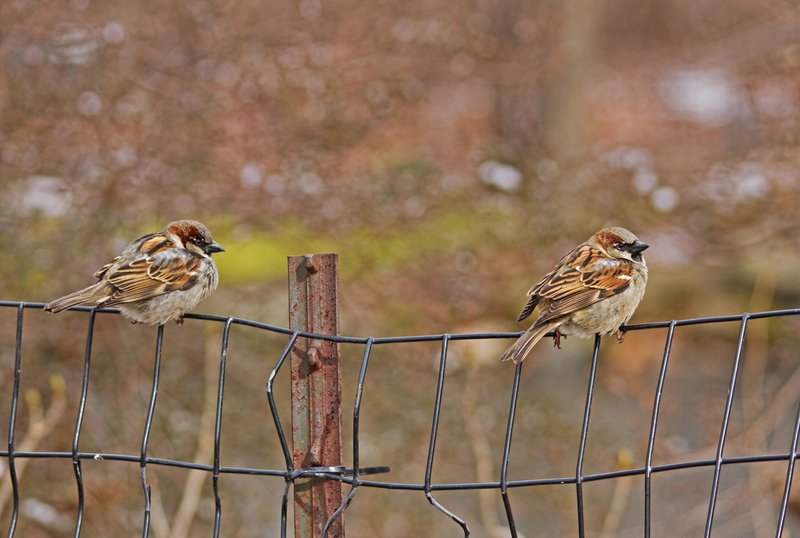 From the sublime to the mundane: two male house sparrows sitting on a fence, thinking about whatever it is sparrows think about. Although I'm always appreciative of the miracle that is Central Park, where I can watch an egret fishing in a pond a few yards from Fifth Avenue, it's still the small common birds, the ones you can and do see anywhere, that I love the most. Yes, I seek out the pretty little warblers when they pass through twice a year, am transfixed by the big scary raptors glowering from the treetops, and went dutifully up to the Shakespeare Garden to see the cute little saw-whet owl everyone was talking about. But none of them make me smile as much as the finches and sparrows and titmice, with their chattering and socializing, their arguments and courtships, their hopping and digging and sudden swoops into flight. They're like Sufi poems, little dervishes, exclamation points in the great prayer that is life in this world, in this universe.